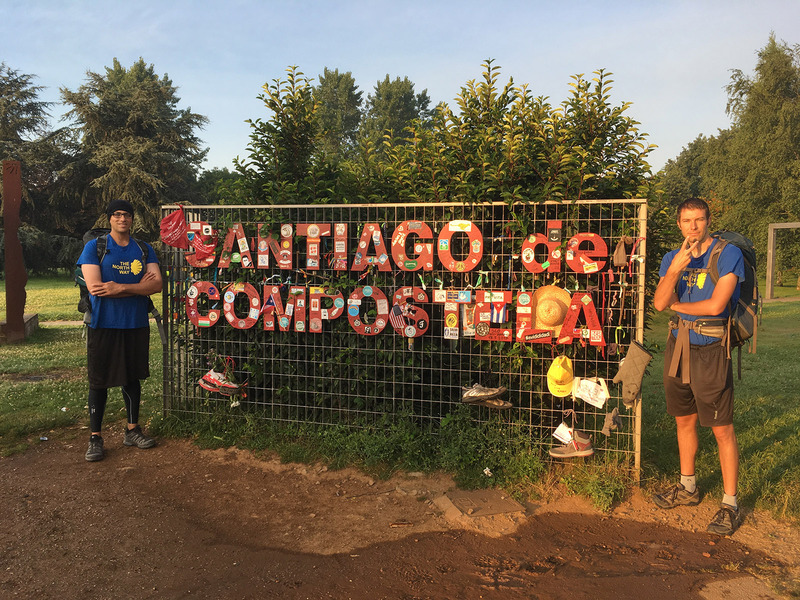 6/18/17 – “815km/506mi” from Monte de Gozo (ok, from Irún, Spain) to SANTIAGO DE COMPOSTELA!!! 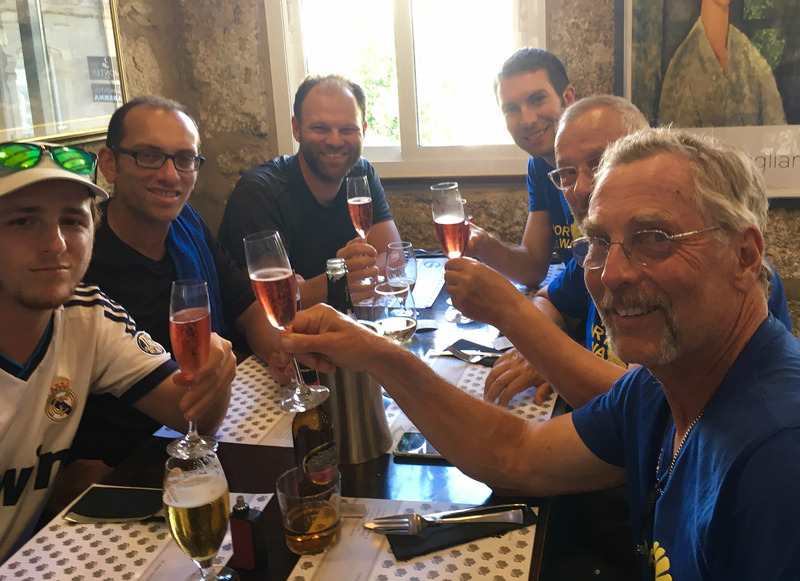 Finally, after a long, difficult, but surely an enjoyable journey, WE REACHED SANTIAGO, which was reason to celebrate! 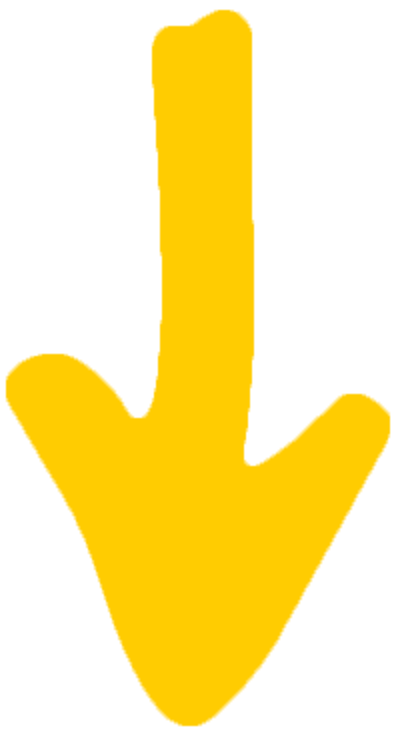 In 2014, we walked 500 miles. And this year, as the song goes, we walked 500 more! 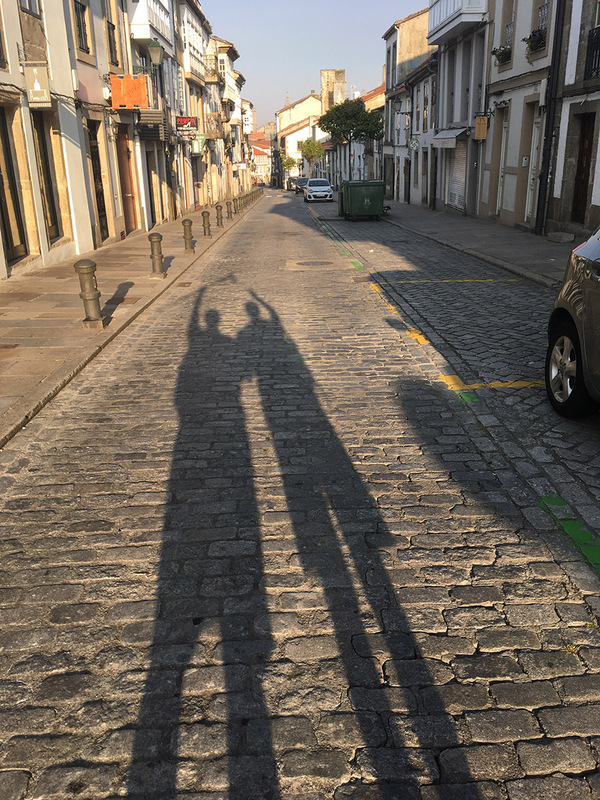 My Compostela (certificate) says we walked 815km from Irun – a place that I feel like David and I were in just yesterday – but we did it…again! 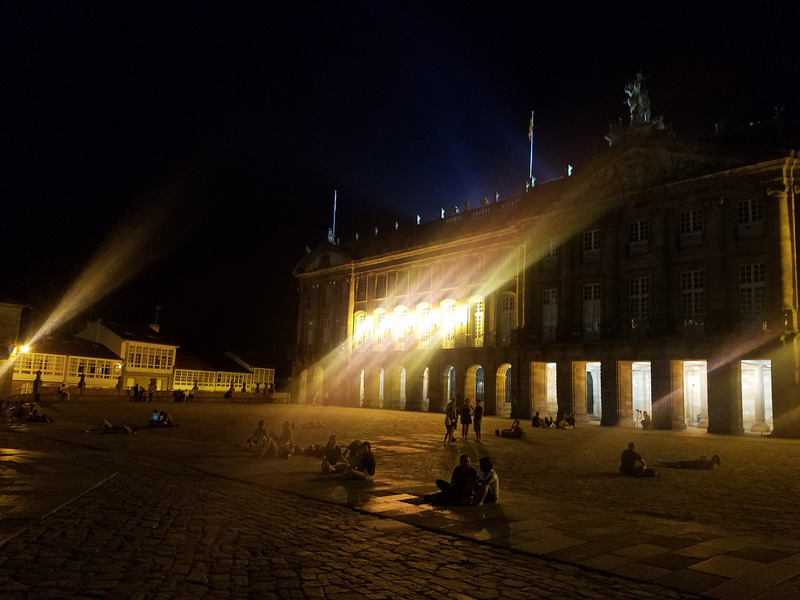 Of course by the GPS and guidebook and step counter, we’ve done a whoooole lot more – especially when you imagine that after a day’s hike, we spend hours walking around whatever town we’ve arrived at, sightseeing or just looking for food or the nearest grocery store. Your legs get a lot more mileage than the straight line of the trip! 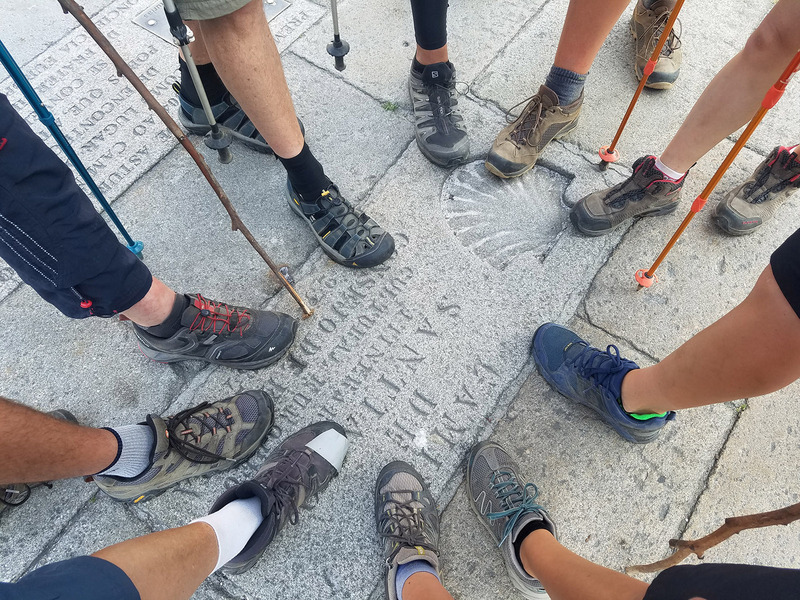 This one was longer, and much more challenging – especially the first seven days, which were tough even for an experienced hiker. The views on this trip were incredible. As I’ve said in previous daily posts, those challenging ups and downs, and being close to the ocean allowed us access to amazing clifftop vistas and serene private beaches. The Camino Frances also had great beauty, but I found myself in wide-mouthed astonishment more often on this one. There were fewer people overall. Last time in SJPP I remember nearly 100 people walking out to start the trek. 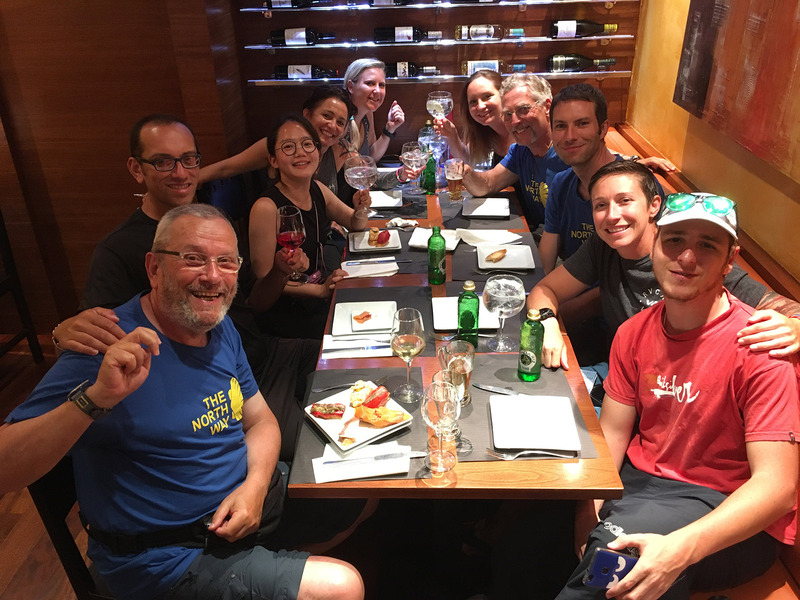 Small tight groups formed (like me, David, and Greg), and mingled with each other at bar/café stops, and at dinners. But you never saw a group of 8-10 people walking together. On this one, it was more isolated, and I think that caused some of the small groups and solo hikers to join into the big one that we eventually had at the end. Food was awesome on this trip, at almost every turn. I felt that some (of course not all) restaurants on the Camino Francès took advantage of tired peregrinos by serving low-quality, small portion meals. Not the Norte!!! We ate very well on this trip, at nearly every place we visited! We saw so many more animals! Herds of cows, sheep, and goats. Innumerable horses, donkeys, and cows we fed. Dogs as big as bears. On the Francès, we had lots more people and a lot fewer animals. CHIMICHURRI! We began carrying this magically delicious condiment after enjoying some homemade stuff at a steakhouse in Nueva. Since then, one of us always had a store-bought bottles on hand. On the Francès I carried Tabasco, but carrying this green magic was even better. Last time, we arrived around 9:30 AM and the city was nearly empty. 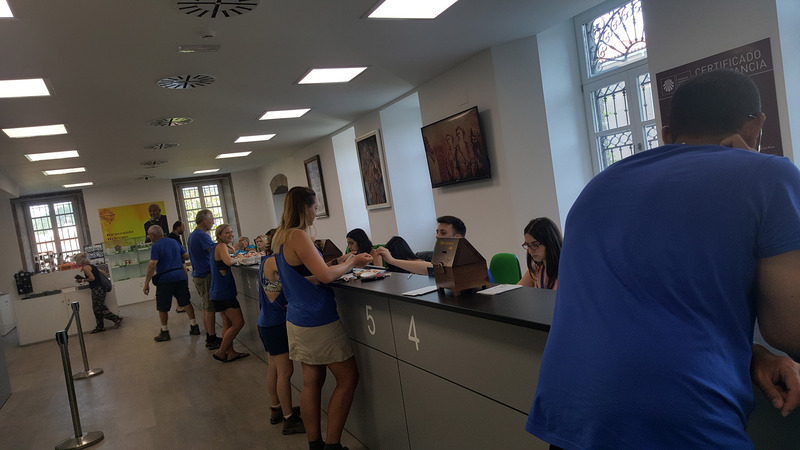 We had almost no line for our Compostela certificates. And then posted up at a centrally-located bar to watch all of our other Camino friends come in as well. 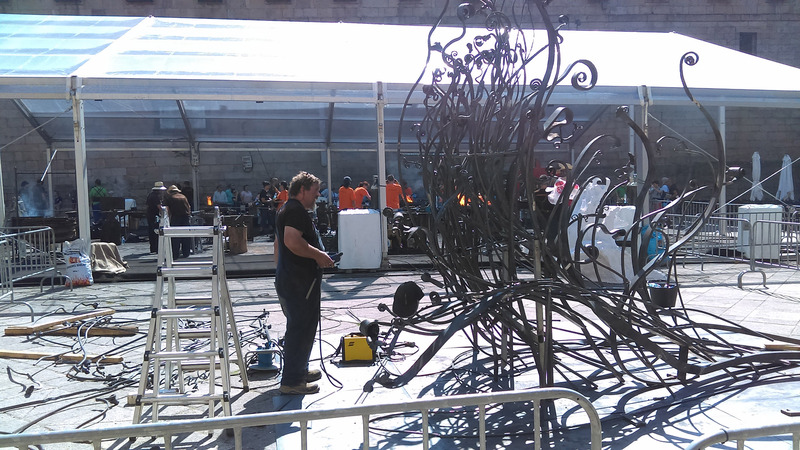 It was really a jubilant atmosphere. 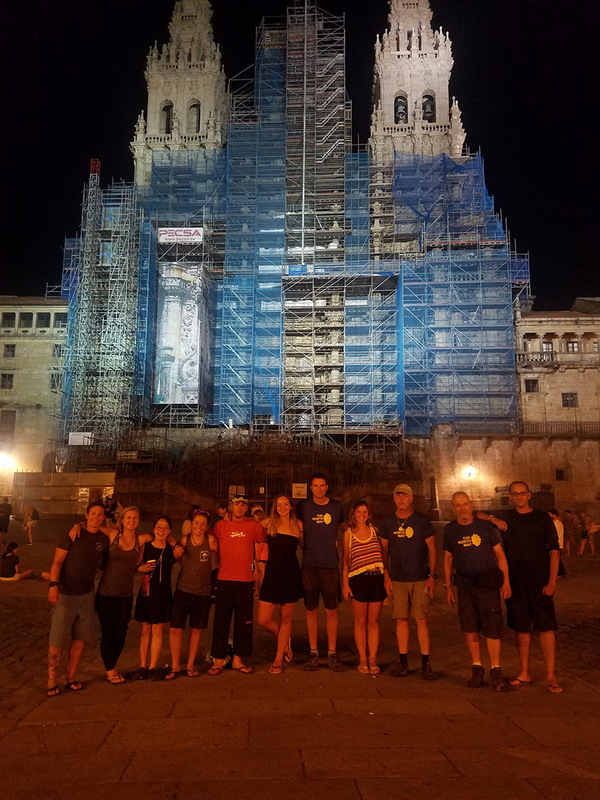 This time didn’t really feel that way – all our best Camino friends were already with us, so we shared the entire journey together. We faced good and bad, happiness and sadness, aches and pains. 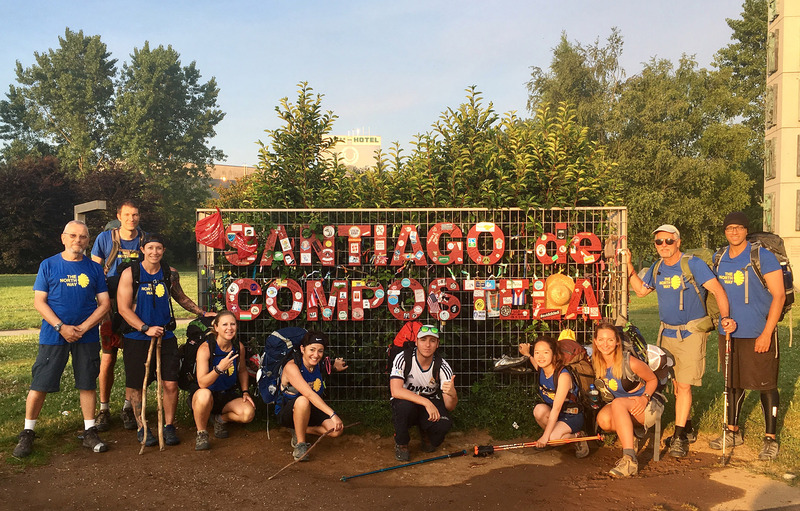 We already had shared it all – for that, or for whatever other reason, I didn’t feel the same major feeling of jubilance or accomplishment upon reaching Santiago this time around. Santiago was filled with tourists. I tried to tell myself that it’s a big enough city for everyone, but after being on your feet for nearly 40 days, you feel like you “earned it” a little more than those who merely flew in. I mentally counted all those who had limps, blister bandages, and hideous tan lines, and counted them all as on “our team.” Last time, I wasn’t as fixated on this – possibly because it wasn’t as hard? Possibly because we just saw so many familiar faces to celebrate with? Who knows. 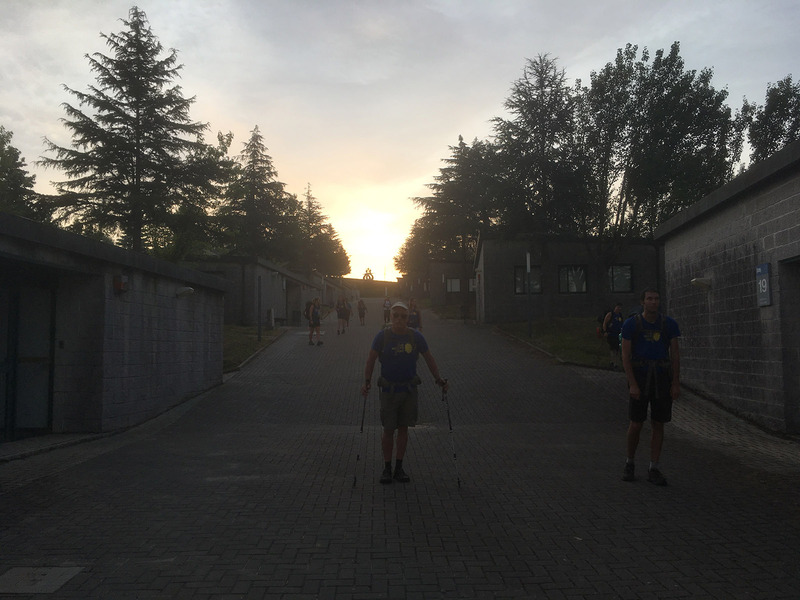 I went to the pilgrim mass was a nice experience, but felt that religious and spiritual aspects were not the most important things to me on this Camino. 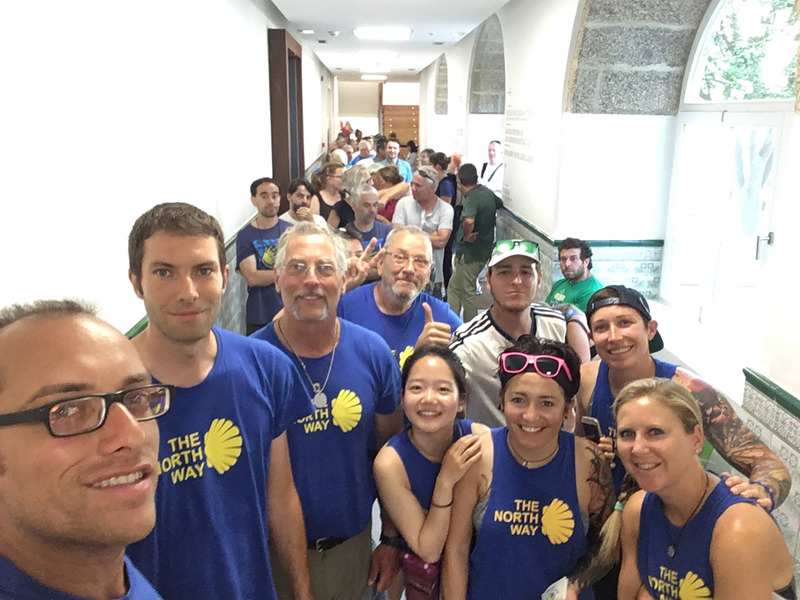 Instead, it was the amazing company of my Camino family. After mass, I rejoined my friends for a well-deserved and delicious lunch. And we enjoyed each other’s company the rest of the day, all leading up to an outstanding dinner at A Taberna do Bispo, one of the city’s best tapas joints. It was an awesome adventure in so many ways, but these people are what made my second trip to Santiago worth making.